Nassarius, common name nassa mud snails (USA) or dog whelks (UK), is a genus of minute to medium-sized sea snails, marine gastropod molluscs in the family Nassariidae. They are scavengers. The name is derived from the Latin word "nassa", meaning a wickerbasket with a narrow neck, for catching fish . Nassarius would then mean "someone who uses such a wickerbasket for catching fish". Species within this genus are found worldwide. 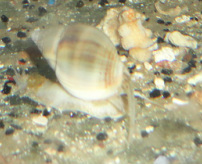 These snails usually live on mud flats or sand flats, intertidally or subtidally. Most Nassarius species are very active scavengers, feeding on crabs and carrion as dead fish, etc. They often burrow into marine substrates and then wait with only their siphon protruding, until they smell nearby food. Care: Please note that because it is an invertebrate, acclimation is critical with this (and really all shrimp). They are intolerant to copper (medications), high ammonia/nitrates, & low salinity.